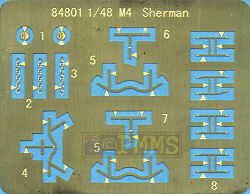 Following on from the cast hull M4A1 Sherman (kit #84801) we will now look at the first of the welded hull Shermans from Hobby Boss, the M4 Mid Production which is basically the same variant as the Tamiya M4 Sherman (kit #32505). If the issues with the cast hull in the first kit were a concern, well unfortunately this kit is no better with some major dimensional discrepancies on the hull and turret and I will make comparison with the Tamiya parts where applicable to illustrate as the Tamiya parts are dimensionally correct when compared to available plans, most notably the 1:48 plans if the Hunnicutt Sherman Bible. 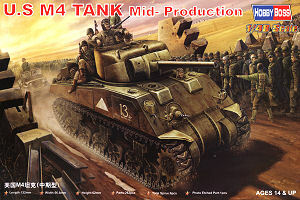 The kit uses sprues A, B, P, Q, the lower hull and tracks from the M4A1 kit with new sprues E, F, and R for this kits which consist of 242 parts in light grey plastic, a small etched fret with 14 parts and a set of vinyl tracks plus the decal and instruction sheets. Overall the detail level is quite good with well defined detail relief such as raised weld beads on the hull and some very delicate parts such as the barrel travel lock, lifting eyes, the tools and bogie detail but unfortunately there is a fair bit of flash evident of many parts plus a few pin marks to be dealt with. The transmission cover is the early three piece bolted type with separate bolted flange strips. Unfortunately the contours of the cover are far too pointed and not the full curve as it should be, also the bolts on the flanges are the same on both sides where they should be different as with the Tamiya parts. The separate final drive covers have substantial moulding seam which is easy enough the clean off but the shape of the cover is another matter. The rear hull panel has separate three part air cleaners with additional small brackets plus the towing shackle and idler mounts with the fit to the hull very good without any trimming needed. The two engine doors are moulded closed but are quite pronounced but this wouldn’t be that noticeable after assembly. The kit includes two types on bogies, one with straight arm return rollers and the other with raised rollers but there is a bit of flash to be removed about the place. The later type with raised rollers also includes the three lower bolts on the bogie housings but strangely the earlier straight arm type does not? Two types of road wheels are included, the open spoked welded type and the solid spoke type which has separate rear inserts to eliminate the hollow look. While the road wheels are the correct diameter there are a few detail issues with the openings in the welded wheels being slightly too big and the wrong shape, this is only minor and may only be problem for the dedicated. The solid spoke wheels also have issues where the six raised ribs are far too small, the rear inserts have the ribs larger than the full wheel but still undersized with the wheels in the Tamiya M4 kits being far more accurate. There are also corresponding open spoke and solid spoke idler wheels but the open spoke idlers have the centre hub too small and the wrong shape openings while the solid spoke idlers have the six hub bolts slightly too big but are probably the better represented of all the wheels. Added to the kit is a third style of driver sprocket, the ‘fancy smooth’ but for some strange reason you only get one sprocket and not a pair which does leave you scratching your head? This is one large moulding with separate front crew hatches and most of the smaller fittings and the weld seams are slightly raised as well as very fine casting numbers on the glacis. The hull width and length are correct but the main area of concern is the front glacis plate angle which is far too shallow being more like 60° than the actual 56° resulting in the top hull join being approximately 2.5mm too far back with this in turn pushing everything on the hull top such as the turret ring and rear deck detail back by the same amount leaving the engine deck 2.5mm too short as the overall hull length is okay. This also results in the detail on the glacis such as the machine gun mounting being “stretched” to fit onto the elongated glacis. Comparison with Tamiya M4 hull with correct dimensions. The engine deck has nice details included with separate part for the forward intake cover although the contours of this are a little “square” and can do with be rounded off a little. Still at the back there are separate grouser covers that have a better rounded profile than the square covers on the M4A1 kit but the “mesh” on the front is again best not spoken of and we will probably be offered as replacement mesh in the inevitable etched sets. The tail lights are nicely moulded for this scale with etched metal faces and bush guards that give a good scale appearance and the two lifting eyes are also separate parts with good scale appearance. All the pioneer tools are separate parts with well done details but the moulded on tool brackets will probable also be in the etched sets to come and the rear hull mounted storage rack is a little chunky as are the hull mounting brackets. Moving to the front the two separate crew hatches have quite nice details on both sides but the doors are slightly over sized but this may not be that noticeable on the final kit. The hatches are also a little thick and stand proud of the hull when fitted closed so some thinning may be in order. The head lights are again nicely moulded for the scale and have etched guards to again give a good appearance and the two lifting hooks look good and the aerial pot is nicely rendered but again a little out of position due to the glacis angle issue. There is a set of appliqué armour panels for the hull sides but these are way oversized but do have weld texture around the edges. Cutting these down to the correct size is easy enough but you will have to add back the wells texture. The tracks are continuous vinyl T48 rubber chevron track the same type as with the Tamiya Sherman kits but there is a problem in that the end connectors and guide teeth are not located centrally between each track link. Instead they are positioned at the edge of each link with one pin of the end connectors level with the division between each link and rectifying this on the soft vinyl is nigh on impossible so it either live with the issue or find alternate tracks. This early low bustle turret has the upper shell and lower ring separate in the usual manner with separate gun and rotor shield, pistol port, lifting eyes and Commander’s split hatch with separate hatches. There is again no cast texture on the turret but this would be very subtle in this scale and there are quite substantial mould marks around the pistol port fairings and on the opposite side which will need sanding off. The actual port hatch is a little undersized and the upper hinge quite large. There is also an issue with the turret height which is about 1mm higher than indicated in the Hunnicutt plans and this has other implications as other parts are oversized in proportion. The M34A1 shield also has no cast texture and is just over 1mm to tall as is the inner gun mounting and the detail on the shield is very basic with poorly defined bolt heads. You do get the early M34 and later M34A1 shields and gun mounts for a choice and the one piece gun tube has the muzzle hollowed out slightly. The barrel measures out about 0.05mm too long when compared to the 1:48 plans in the Hunnicut Sherman book and actual data which shows the length of the barrel outside of the turret is 67.625inches which equals 1717.672 millimetres or 35.785millimeters in 1:48 scale. 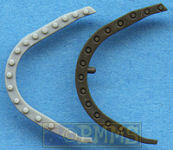 The top ventilator is the correct size and included subtle weld beads around the guard as well as the drain hole indentations while the Tamiya ventilator is slightly undersized without any texturing. 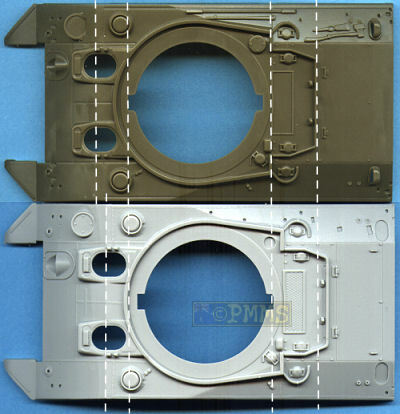 The Commander’s hatch ring has a fair bit of flash around the bottom while the split hatches have quite nice detail on both sides but are again slightly larger than the Tamiya hatches and sizes indicated in the Hunnicutt plans but not enough to really stand out. Appliqué armour is provided for the right cheek but again this is massive are nearly takes the whole side of the turret and the .50cal MG included is quite nice for this scale and includes an ammo box for mounting on the hatch pintle. 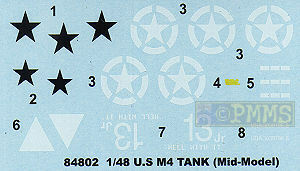 There are markings for two US vehicles in olive drab but no information is given on the units and there is a colour sheet is included with illustrations of the two marking options showing the decal placement. Thrown in for good measure is a small sprue with twenty rucksacks which have quite good detail and will come up well with careful painting as well as a selection of jerry cans with strange looking embossing on the cans but with separate handles and a few wood boxes and small metal drums to add as stowage. Well we again get quite a mixed bag here with some very nice petite detailing but a bit of flash and other cleanup needed with the overall dimensions of the kit being quite poor unfortunately. There are numerous detail issues from the hull glacis angle and mantlet contours, the track end connectors, transmission cover profile to the road wheels details and others in between. But the bogie units are very well done as are some other parts but the overall impression leaves you asking just what are Hobby Boss doing, surely getting the basic angles and sizes correct is not asking too much in 2006 as it’s not like there are no preserved examples to look at, let alone measure. But as a preliminary comment of the M4A3 hulled kits I’m happy to say the hull size and 47° angle of the glacis is correct so there may be light at the end of the tunnel. Not recommended, get the Tamiya M4 kit.